This year will be an exciting one filled with innovation alongside mental wellbeing, environmental responsibility and security. Below are our 7 trends to take note of this year when planning your event. One of the things our own team are interested in is a wearable gesture control device that lets you take control of your phone, computer and so much more. The armband from Myo was seen a couple of years back in the mainstream when Armin Van Buuren began controlling the light and stage effects during his shows. Controlling the visual stage is one thing, but this nifty bit of kit also has corporate presentation capabilities and Drone applications. The ability to control everything with the wave of your hand opens up amazing potential in the experiential events sphere. Last year Apple once again made headlines with its facial recognition capabilities and when we visited Event Tech Live last year, one of the things that stood out was the facial recognition tech on display. The ability to use facial recognition for security and also track real time, real world analytics has the potential to be game changing in the events sphere. The ability to understand how your customers react, and what they are reacting to and if what you are putting in front of them holds their attention has the ability to bring some insight to event organisers in the moment, effectively negating the need for post event surveys and additional feedback forms. 2017 saw a huge drive in awareness regarding the mental wellbeing of staff within the sector. While companies will be looking for ways to create more environments that focus on improved wellbeing, there looks to be an increasing trend of carrying this over into events, with ideas of quiet spaces for delegates to unwind and process what they have experienced or learned, and Wi-Fi free zones being added to the event planner’s checklist. The need to remove unnecessary plastics from events is an inevitable trend for 2018. A current campaign that The Bulb supports states that plastic straws, cups and utensils at events are #PointlessPlastics, and with environmental consciousness coming ever more to the fore in many companies’ agendas, the industry needs to keep ahead of the game here by coming up with better sustainable and environmentally viable solutions for events. We can no longer afford to be complacent, and our industry is well placed to make a positive impact. Last year was a shocking reminder of just how important event security is. The Ariana Grande concert in Manchester and the Las Vegas shooting incident at the Harvest Music Festival on the strip were the big stories of last year pertaining to event security. Safety and security has always been important for event organisers and suppliers alike but we expect it to be a case of getting back to basics with a better focus on event security planning, and the wider spread use of some of the event technology mentioned earlier which will include crowd tracking, and facial recognition. We’ve all heard about Bitcoin and it’s rise in popularity means that it is starting to emerge from the online world into the physical. With the Bitcoin prepaid card, and now the ability for businesses to accept Bitcoin payments just as they would any other, cryptocurrency is set to be on the rise in 2018. Research has shown that millennials value events over purchases, meaning they are more likely to spend money on attending events and value experiences rather than amassing possessions. Figures from Eventbrite show that 77% say their best memories are from an event or live experience, and 69% believe that attending events keeps them connected to other people. In this digital age where life is often lived and shared online, it shouldn’t really be a surprise when human interaction is sought out. 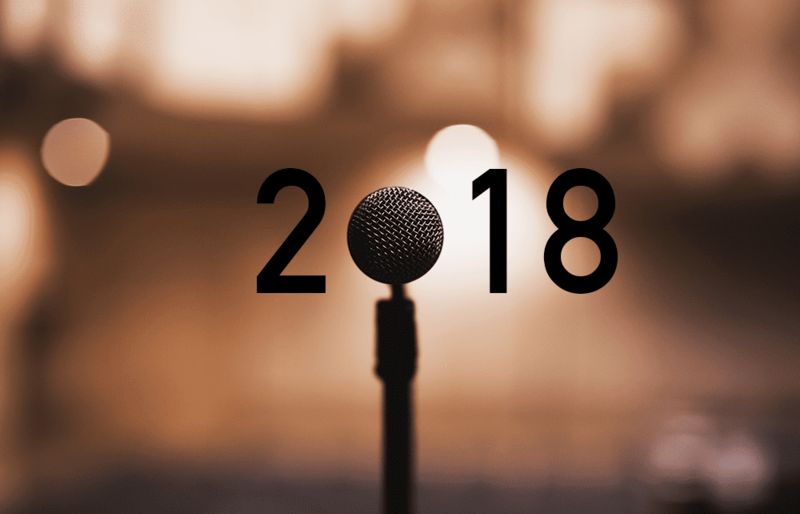 This is good news for the events industry as we move into the year with our conferences, exhibitions, parties, and festivals at the ready to meet demand. If there is anything that you think we missed, leave a comment below.